Tart, salty, sweet, and spicy. Words that describe both my personality and so many amazingly delicious Thai dishes. Somewhere between daily massages, beach treks, yoga classes, and steam baths, I learned how to cook healthy Thai cuisine at a fantastic health retreat and juice-fasting spa in Thailand called Samui Detox, high on a mountain on the north side of Koh Samui. (www.samuidetox.com) The owners, a couple named Kim and Gee, met while working together at another spa before they fell madly in love and decided to open up shop for themselves. Kim is a highly trained martial artist, yogi, and masseuse from the UK who led our yoga classes and gave daily lectures about nutrtition and such. Gee, her Thai husband, runs the majority of the operations side of things, and is also one of the rare “masters-of-all-trades”, having successfully forayed into a number of different businesses throughout his life. His “mother” career, though, was in the kitchen quite literally – and by literally, I mean that his elderly mother came out of retirement to open her fifth or sixth flourishing restaurant last year just to have something to do! Gee knows traditional Thai cuisine by heart, but wanted to offer more healthful and spa-like alternatives to his clients. The FIRST time I spent a month with Kim & Gee, he was just initiating a cooking class which he invited me to join, even though it was not technically part of my program. And the LAST time I spent a month with these fabulous folks, he dedicated one-on-one time to teach me some of the finer points. There have been even more visits and learning opportunities in between, and this is one cuisine that I have true love for. 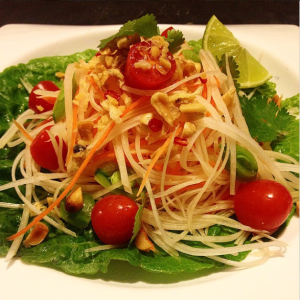 One of the greatest – and simplest – recipes is the green papaya salad. Here we have the tartness of the lime & papaya, the saltiness of the fish sauce or other dietary alternative, and the sweetness of the coconut sugar and grape tomatoes. Add some spicy if you likey with red chili, and you have a winner all around! 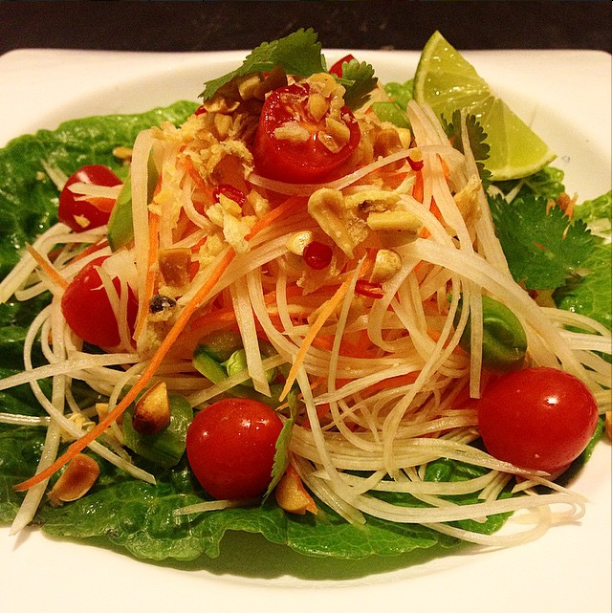 Southeast Asia’s most popular salad, green papaya with sweet & salty lime dressing! Combine all the ingredients of the dressing and set aside. 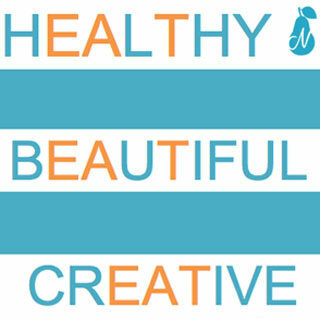 Toss the papaya, carrots, beans, tomatoes with the dressing in a large bowl. Line a serving dish with washed lettuce leaves and arrange dressed salad on top. Garnish with cilantro leaves, chopped roasted peanuts, and crispy shallots. Enjoy! * Green papayas are best found at Asian markets, and some Latin ones, as well. If you can’t find them in your locale, a great substitute is chayote squash, also known as christophene or mirliton. It’s a small, pear-shaped sqquash with a pit that is far more available! *** Tamari if you’re keeping it plant-based, coconut aminos if plant-based AND Paleo! Always organic. Always gluten free. Always clean. Tailor made to accommodate diets including, but not limited to, vegetarian, vegan, paleo, dairy-free and raw.